Paris is a city that is renowned for its amazing culinary traditions. Connoisseurs of food are obligated to reserve a little time to savior a meal at one of Paris’s many three Michelin stars restaurants. With all these restaurants preparing amazing food, using only the freshest ingredients, you will be assured to have a gastronomic experience that will be remembered a long time. Be warned though, the experience will not come cheap and you will need to book a table well in advance. This Michelin 3 star restaurant is run by supremely talented chef Yannick Alleno. His efforts, including such signature dishes as calf sweetbread and mushroom béchamel, have raised this restaurant from one Michelin star to 3 since he took over the head chef duties in 2003. With a restaurant interior that draws comparison to Versailles – with its antique mirrors, large bay windows and crystal chandeliers – restaurant goers are assured a visual as well as a culinary feast of the senses. 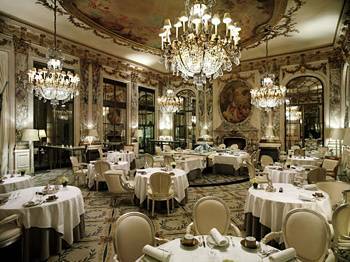 Unlike Le Meurice Arpège adopts a more simplistic decorum in its dining room. With that said however, there is nothing simplistic about the meals coming out of head chef Alain Passards kitchen. The dominant feature of his dishes are truffles, the Thai crab curry is certainly a dish that must be tried. Other specialties include shell and monk fish with mustard sauce and couscous with vegetables. A restaurant so elegant and well regarded that it is recommended to make reservations at least one month in advance. Set within a seventeenth century building L’Ambroise, a 3 Michelin start restaurant since 1986, has exquisite luxury to match the mouth watering creations of head chef Bernard Pacaud. Some of the house specialities include a rack of lamb with nougat and crawfish soap. L’Ambroise is also known for its decadent deserts. This classic restaurant was first established in 1792 by Pierre Ledoyen. Near to the iconic Champs Elysees this restaurant features high ceilings, a spacious dining room, and numerous windows that give a lovely view of the Petit Palais. Head chef Christian Le Squer serves up dishes like cream of porcini mushroom sauce and smoked eel spaghetti. Though this restaurant is by no means cheap, it is the most affordable of the options listed here.